Supreme Court Bar Association permits Ram Jethmalani to campaign for Narendra Modi. 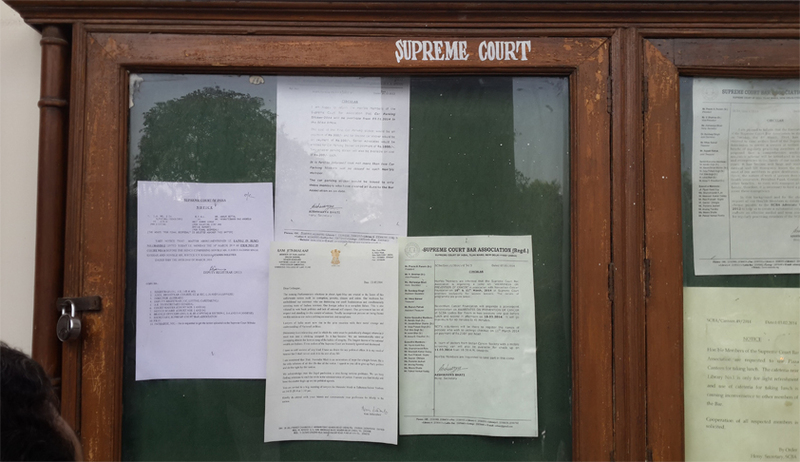 Lawyers in the Supreme Court are highly critical about Supreme Court Bar Association (SCBA) for their proactive action of permitting Ram Jethmalani to use its notice board for Narendra Modi campaign. Lawyers say that it is unheard and unprecedented. The controversial letter issued by Ram Jethmalani, on his letter head as Rajyasabha Member has already invited much criticism from the general public, but SCBA has gone one step ahead by displaying the letter eulogizing Narendra Modi , prominently on its Notice Board. It has been a practice followed by Supreme Court Bar Association to display the notices of various organizations, irrespective of their political affiliation, if they are related to seminars or symposiums about law or matters connected to law. Departing from the practice, for the first time in the history of Bar Association, it has permitted its official space to be used for political campaign. Though in the letter Sri Jethmalani has appealed to give up party politics, the wordings of the letter is interesting and gives out an impression that Mr Jethmalani himself doubts about his intentions. The letter reads “I have no self interest of any kind. I have no desire for any political office. It is my word of honour that I shall never seek it in the rest of my life”. He goes on further stating that Narendra Modi is the only solution of all the ills that ail the nation. Though leaders of the Bar Associations normally affiliated to various political parties, it is not reflected in the functioning of Bar Associations. The Bar Associations are treated with dignity as they are also part of Justice delivery system in the country. When there is a thought process running that opinion of Bar Associations should also be given due consideration in selection of Judges, it is rather paradoxical to indulge in sheer party politics, though in his letter Jethmalani appeals to the lawyers to give up party politics.